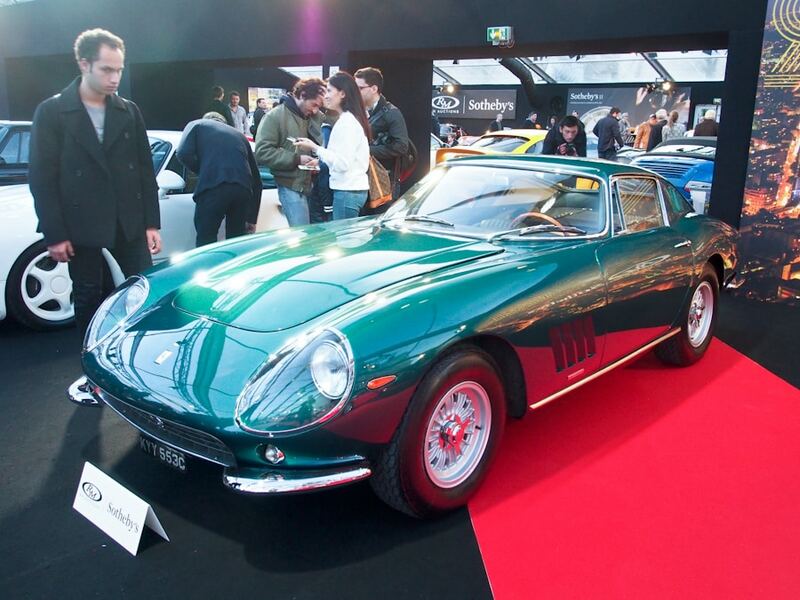 RM Sotheby’s kicked off the auctions in Paris during Rétromobile this year with a Wednesday evening sale of 77 lots. Pre-sale highlights included a Ferrari 275 GTB and 365 GTB/4 Daytona with period performance modifications, an Alfa Romeo Tipo B P3 Monoposto, the first Porsche 917/10 and a Porsche 959 Sport. Also scattered under the tents in Place Vauban were sixteen Ferraris (seven of them built since 2000) and nineteen Porsches from the 911-era ranging from a 901 Cabriolet Prototype to a 2016 911R. Eight of the Porsches had been built since 2000 showing clearly that the fascination with high performance, limited edition Porsches of the 993 and 996 eras has not worn off at all. 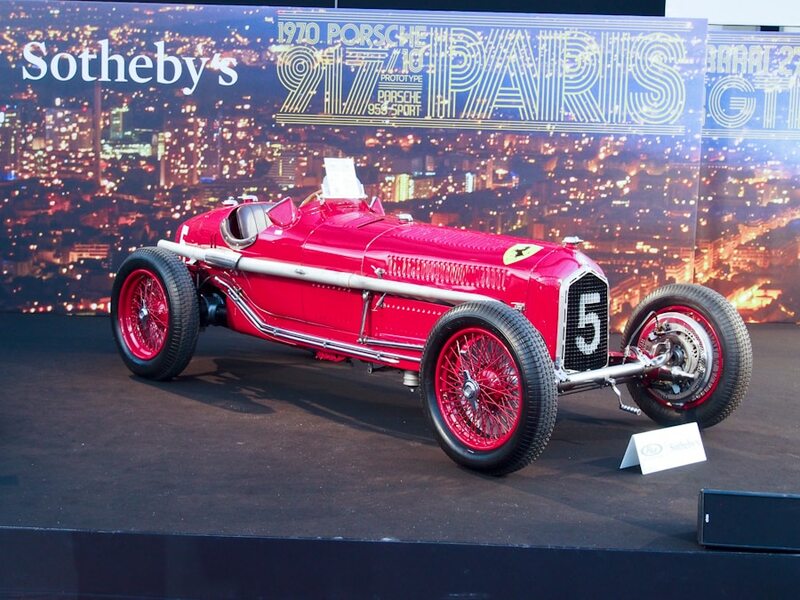 2017 was RM Sotheby’s strongest sale in its four-year Paris history. It is a noticeably consistent sale: never under $20 million, sale rate never under 76%, nor over 80%. It is a valuable presence for RM in Europe fitting neatly between London in the fall and Villa Erba/Monaco in late spring. The effect of exchange rates became evident here, and continued to be evident in the other two auctions this week, with a strong dollar skewing the apparent prices lower when expressed, as here, in dollars. Experience indicates that swings in exchange rates take a while to be reflected in on-site prices. It produces some potential for currency arbitrage which translates these days into buying in Euros or Pounds and selling in dollars. Even with transport costs, the arbitrage on expensive lots can be meaningful. But it makes comparing prior transactions to current ones a bit more complicated, as some of these results indicate. 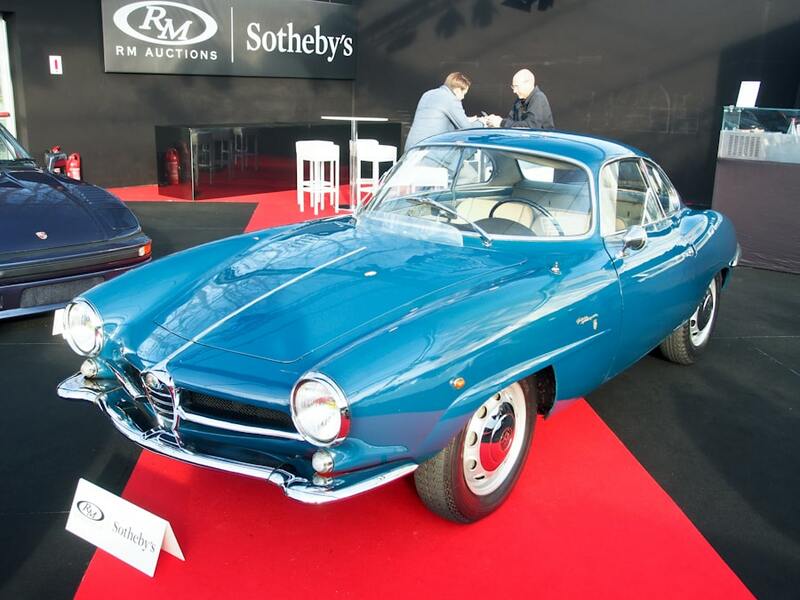 Lot # 104 1962 Alfa Romeo Giulietta Sprint Speciale, Body by Bertone; S/N AR177369; Engine # AR0012001691; Blue/Beige cloth, Grey vinyl; Estimate $128,496 – $160,620; Visually maintained, largely original, 3- condition; With Reserve; Not sold at Hammer bid of $85,664 – 5-speed, silver steel wheels, hubcaps, Michelin ZX tires. – Poor old repaint over old paint and chips. Soiled, stained original interior. Poor trim chrome, peeling rear fender trim. Underbody painted assembled. It appears to be all here but it needs everything. – This was so obviously a restoration project it was hard to get excited about it. There’s no ‘Preservation Class’ entrant here, just a tired old car with ugly stained upholstery that prompted a wag from Seattle to opine, ‘A new owner with an incontinence problem won’t have to do the interior.’ Ugly and this was a realistic bid for it. 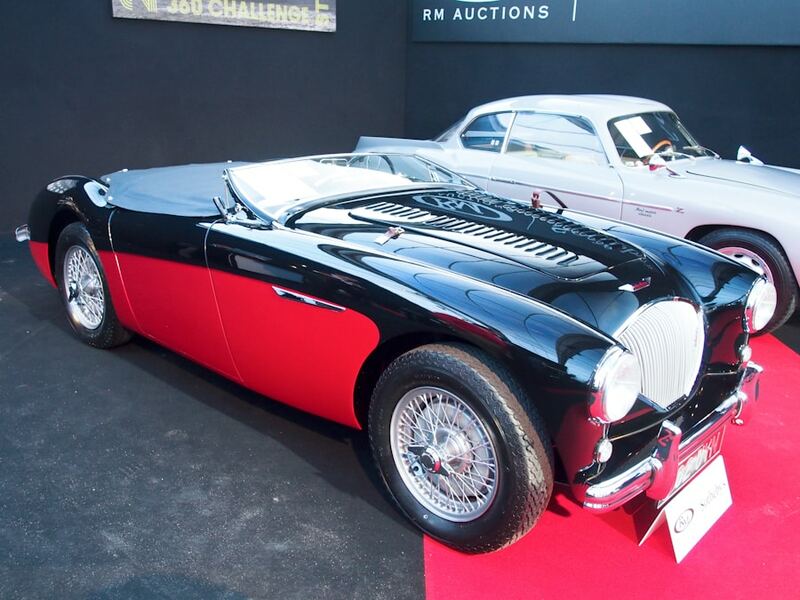 Lot # 106 1956 Austin-Healey 100/M Le Mans Roadster; S/N BN2L/230813; Engine # 1B/230813M; Black, Raven Red/Red vinyl; Black leatherette top; Estimate $182,036 – $224,868; Recent restoration, 2- condition; With Reserve; Hammered Sold at $192,744 plus commission of 12.00%; Final Price $215,873 – Silver painted wire wheels, 4-speed, overdrive, louvered hood. – Restored in the States from a derelict project with a replacement Kilmartin chassis. Good paint, chrome and interior but a disappointing underbody with red overspray in the rear wheel wells. Good dash and gauges. Fresh, orderly engine is like new. An attractive, freshly done, comprehensive restoration let down by the underbody and overspray. – 100/Ms seem to have been everywhere this month. 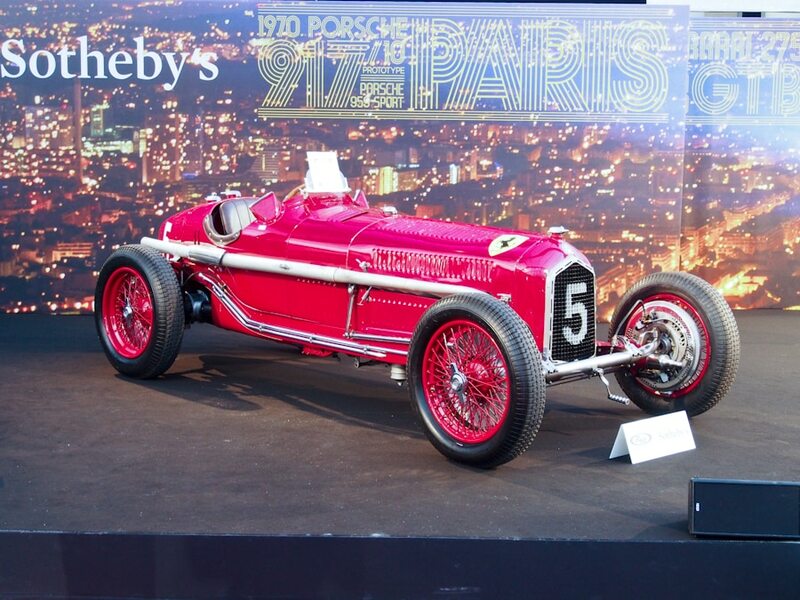 There were two in Scottsdale ($165,000 and $203,500 at RM and Worldwide) and two here in Paris where Bonhams sold its example for $202,236. Those results eloquently pinpoint the present appetite for accurately restored 100/Ms while also showing the renewed (and to some, long overdue) appreciation for the best early Healeys which are accurately described as ‘sports cars’ in contrast to the ‘grand touring’ character of the Big Healeys and particularly the late BJ8s. This result was right on the money and the seller, buyer and auction company should be pleased with the outcome. 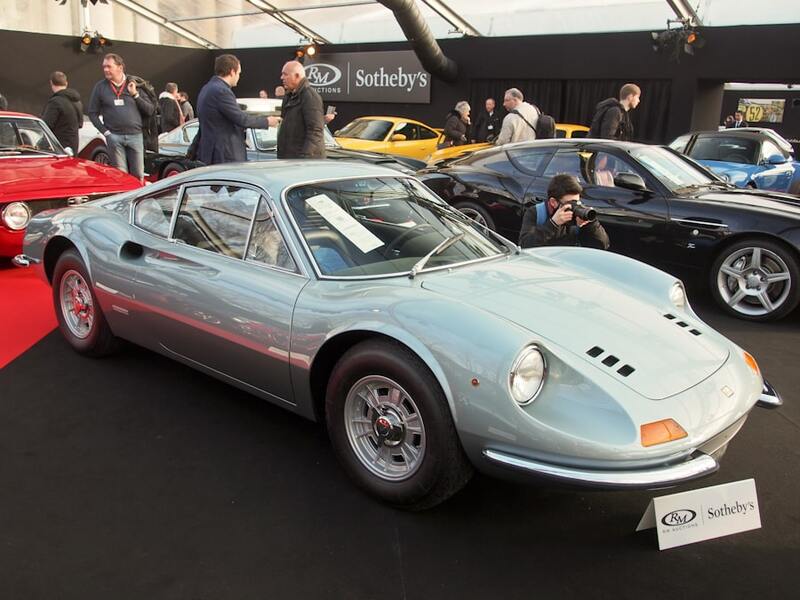 Lot # 108 1970 Ferrari 246 GT Dino Coupe ‘L-Series’, Body by Pininfarina; S/N 01004; Engine # 05612; Celeste Blue/Black vinyl, Blue terrycloth; Estimate $401,550 – $455,090; Recent restoration, 2+ condition; With Reserve; Hammered Sold at $428,320 plus commission of 12.00%; Final Price $479,718 – Centerlock alloy wheels, Michelin XWX tires, Ansa exhaust, original manuals and tool kit. – Excellent paint, chrome and interior. Underbody done like new. Sharp, clean, crisp, fresh engine compartment. Freshly restored like new in its original colors. – This has to be one of the best Dinos on the planet, with seemingly every detail attended to with care and sympathy. At this price it better be, because this is a record for a Dino without some special history and upends the recent softening trend in Dino prices. 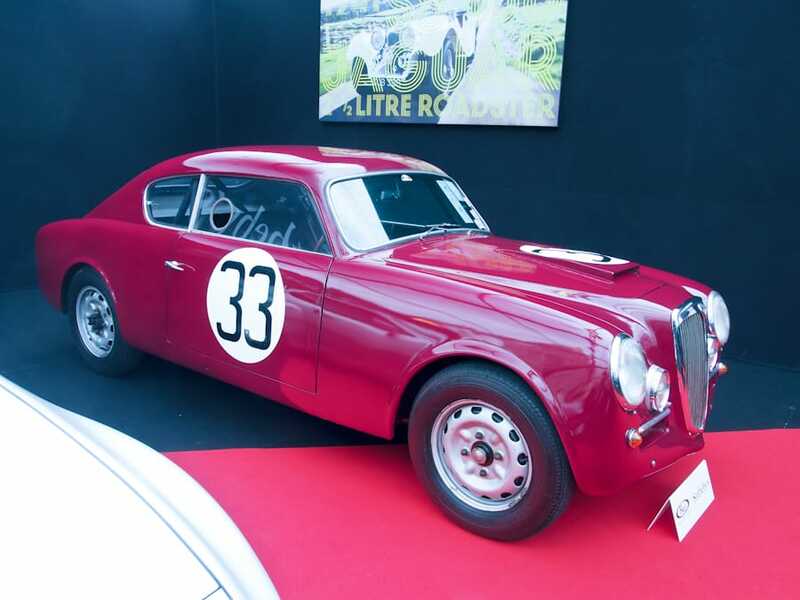 Lot # 110 1952 Lancia Aurelia B20 GT Series II Coupe, Body by Pinin Farina; S/N B201824; Engine # B203074; Dark Red/Black vinyl; Estimate $139,204 – $171,328; Modified for competition during restoration 4 condition; With Reserve; Hammered Sold at $133,850 plus commission of 12.00%; Final Price $149,912 – Braced rollbar, 4-point belts. – Later 2,451cc/118hp engine, disc brakes. Vintage raced in the UK in the 70’s. Horrible old repaint over visible sanding scratches, overspray everywhere. Sound upholstery on bucket style seats. Silver painted window trim. Scrofulous. – Sold by RM at Monaco in 2010 for $134,085. That transaction was Euros 100,800 compared with Euros 140,000 all-in here, much more in Euros today, but barely $15,000 more in US American. It has potential, but it begs for attention both cosmetically and to ensure safe and reliable historic racing. It’s a sound value in dollars, but expensive in Euros. 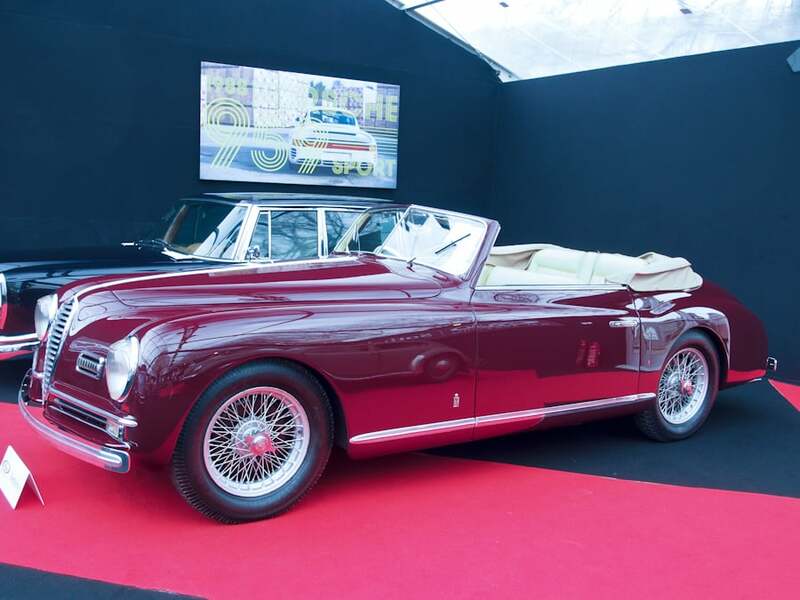 Lot # 119 1957 Lancia Appia GT Coupe, Body by Zagato; S/N 812011874; Engine # 814005497; Silver-Grey/Beige leather, Red piping; Estimate $192,744 – $214,160; Visually maintained, largely original, 3+ condition; With Reserve; Hammered Sold at $182,036 plus commission of 12.00%; Final Price $203,880 – New Jaeger tach, dual outside mirrors, Michelin XAS tires, Nardi woodrim steering wheel, floor shift. – Dull original gauges. Sound but aged upholstery and interior trim. Dull, water spotted bright trim. Scratched driver’s door window. Sound recent repaint. Underbody has been done but has plenty of miles. – A beautiful, lightweight Zagato body is the only way to make up for the challenged performance of 53 horsepower but even that inducement is not enough to make this price anything but expensive for this mediocre restoration and the subsequent miles. 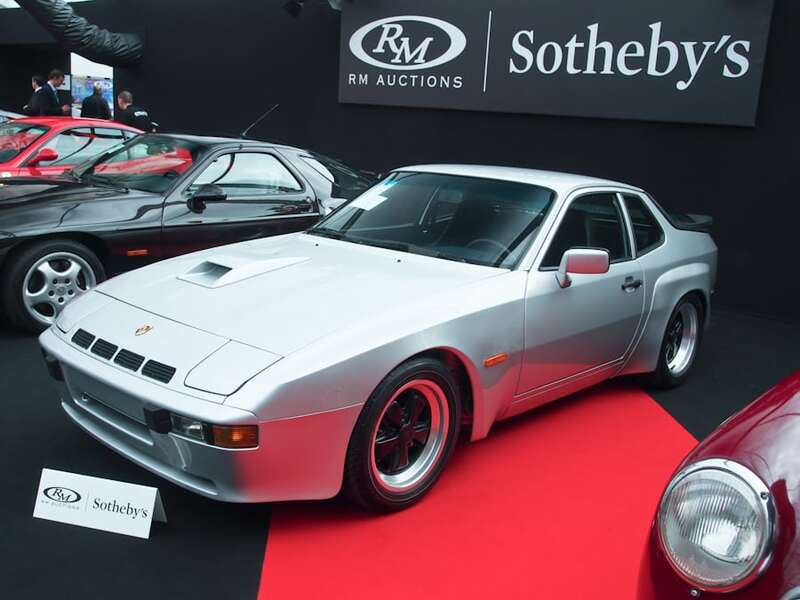 Lot # 123 1981 Porsche 924 Carrera GT Coupe; S/N WP0ZZZ93ZBN700218; Silver/Black cloth; Estimate $74,956 – $96,372; Visually maintained, largely original, 3 condition; No Reserve; Hammered Sold at $87,806 plus commission of 12.00%; Final Price $98,342 – 210hp 1,984 cc turbocharged, intercooled engine, 5-speed, Black center Fuchs wheels, Dunlop tires, power windows. – Freshly painted Silver, including the wheelwells, but not the body supports. Clean original engine compartment and interior. A sound used car with a fresh but erratic cosmetic restoration represented as ‘fully restored’. – The consignor’s definition of ‘fully restored’ was apparently shared by the bidders, and this is after all one of the rarest of Porsche high performance cars, rarely seen today in any condition. It qualifies as ‘good’ but brought a ‘great’ price. Lot # 131 1988 Porsche 959 Sport Coupe; S/N WP0ZZZ95ZJS905011; White/Grey cloth; Estimate $1,606,200 – $2,141,600; Unrestored original, 2 condition; No Reserve; Hammered Sold at $1,873,900 plus commission of 12.00%; Final Price $2,098,768 – White alloy wheels, Bridgestone tires, roll cage. – One of 29 959 Sports built, originally purchased by Vasek Polak, three owners from new. Odometer shows 11,540 believable kilometers, original throughout and nearly like new. – 959 Komforts are fairly commonplace these days, with two at the Scottsdale auctions and another here in Paris. They are reliably $1 million cars, give or take a hundred thousand dollars, but bear only a visual resemblance to the Sport model. 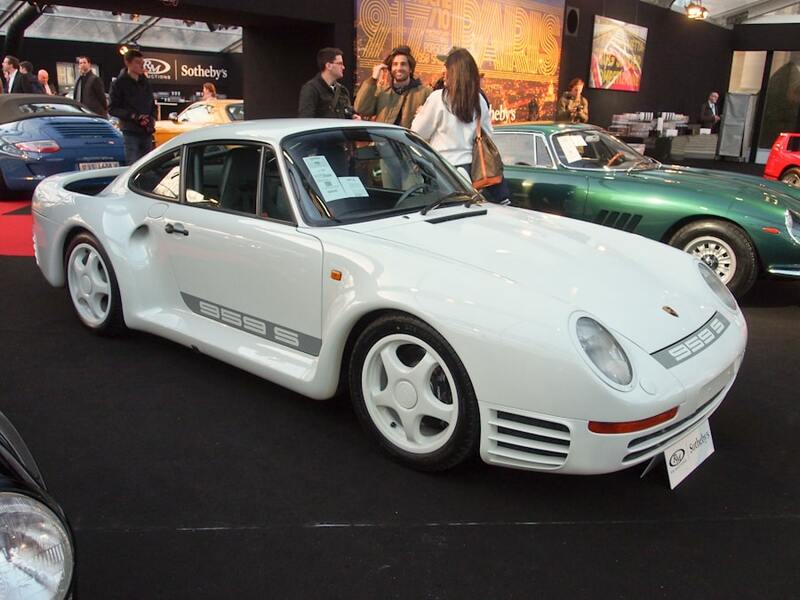 Produced in a tiny quantity and putting out 65 more horsepower the 959 Sport is exceptionally rare and this one is barely used and in pristine condition. 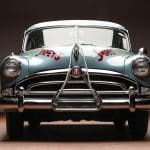 Gooding sold one at Amelia in 2014 for $1.1 million and another at Scottsdale in 2015 for $1.7 million putting this result, particularly when expressed in currently strong US $, in perspective. It is an expensive car, and it deserves to be. Lot # 135 1948 Alfa Romeo 6C 2500 S Cabriolet, Body by Pinin Farina; S/N 916009; Dark Red/Beige leather; Beige cloth top; Estimate $214,160 – $321,240; Older restoration, 3- condition; With Reserve; Hammered Sold at $214,160 plus commission of 12.00%; Final Price $239,859 – RHD. Silver painted wire wheels, Michelin tires, column shift, radio, banjo spoke steering wheel, translucent sun visors. – Bought new as a gift for a mistress, Emilia Sierra. Sound recent repaint over old paint. Sound older upholstery, lightly soiled and surface creased. Orderly old underbody and erratic chrome. An older restoration with more recent paint. – Emilia must have been someone very special. 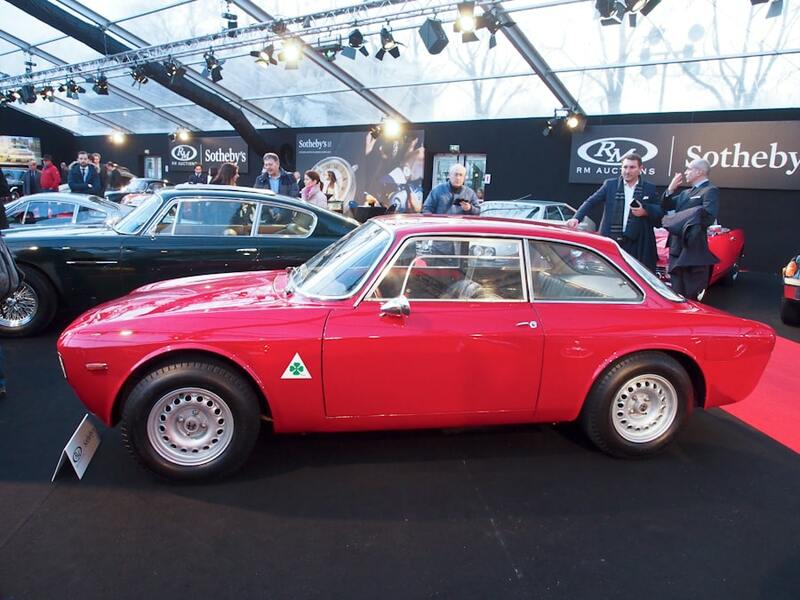 This Alfa was sold by RM in London in 2012 for $297,731, GBP 184,800 (Euros 229,800) at the time which is somewhat less than the GBP 191,200 that this Euro result converts to. The vagaries of exchange rates play no favorites and this is a realistic price for this Alfa’s condition in pounds, Euros or dollars. 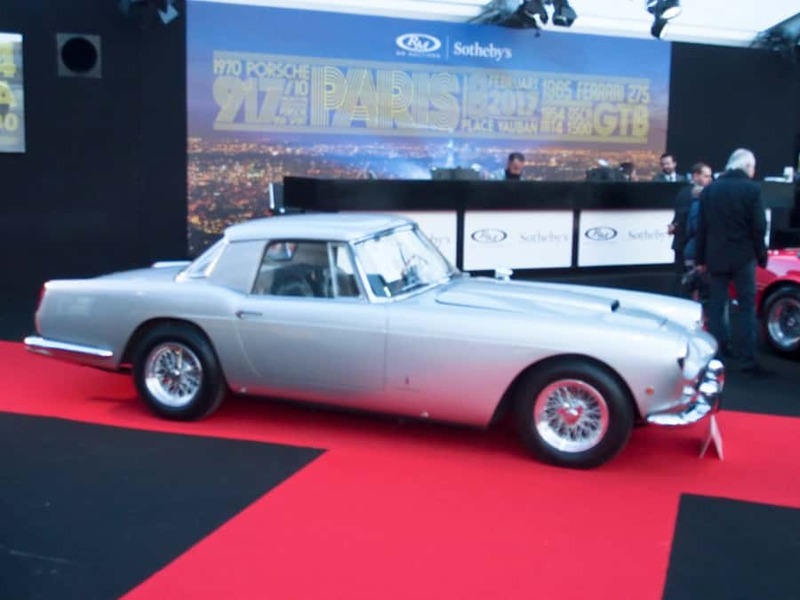 Lot # 137 1963 Ferrari 250 GTE Series III 2 + 2; S/N 4139GT; Engine # 4139GT; Grigio Scuro/Red leather; Estimate $460,444 – $513,984; Recent restoration, 2 condition; With Reserve; Hammered Sold at $449,736 plus commission of 12.00%; Final Price $503,704 – Overdrive, chrome spoke Borrani wire wheels, Avon tires, Autovox radio, Marchal head and fog lights. – Disassembled for restoration in 1970, then stored in pieces until 2011 when it was restored and completed in 2014 by GTO Engineering. Very good paint, major chrome and interior. Some scuffed bright window trim. Clean and orderly restored underbody. Ferrari Classiche certified, 29,000 km from new. As good as it gets. – This result may be a bit rich in today’s Euros, but it just right when expressed in dollars. 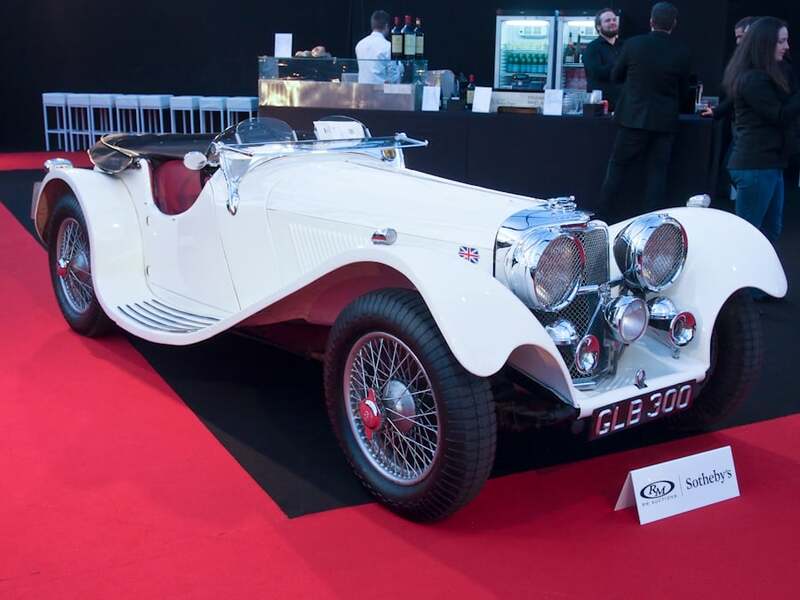 Lot # 138 1941 SS Jaguar 100 2 1/2 Liter Roadster; S/N 49061; Engine # L985E; OE White/Red leather; Black cloth top; Estimate $412,258 – $476,506; Cosmetic restoration, 3 condition; With Reserve; Not sold at Hammer bid of $342,656 – RHD. Silver painted wire wheels, Blockley tires, rear mounted spare, folding windshield, dual aeroscreens, Lucas headlights, Marchal driving light, headlight stoneguards. – Represented as matching numbers. Displayed at The Henry Ford 1955-57. Good older repaint and interior with creased driver’s seat cushion. Tired old top and tonneau cover with cracked, duct taped binding. Very good chrome. Road grimy chassis. – Offered by Sotheby’s at Hendon in 1993 with a reported high bid of $96,232 (GBP 65,000 at the time), a result that is particularly irrelevant due to age and the fact it didn’t sell. This bid, though, for a fairly tired old restoration with just 2.5 liters, 102hp and no significant history is remarkably generous and really could have been accepted with barely a hint of regret. 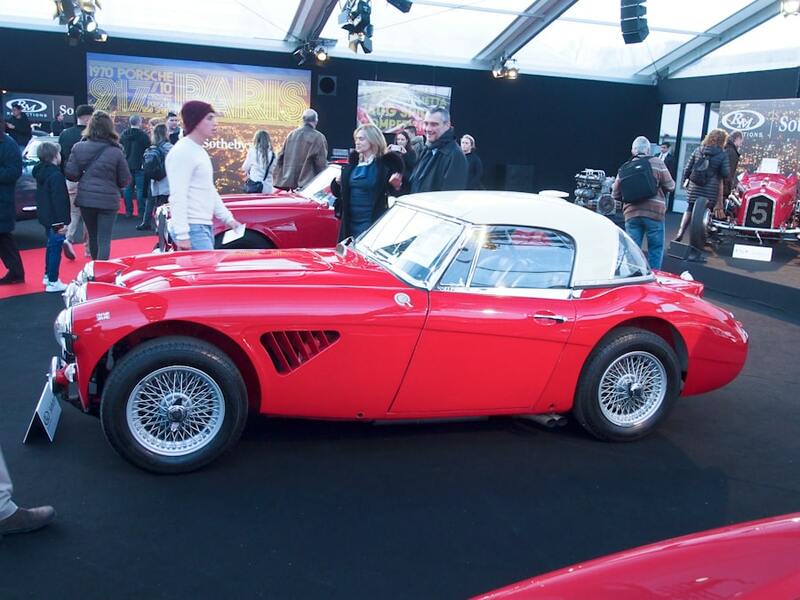 Lot # 141 1964 Austin-Healey 3000 Mk III BJ8 Works Rally Car; S/N HBJ827537; Engine # 29K/RU/H2173; Red, Cream hardtop/Black leather; Estimate $364,072 – $481,860; Competition restoration, 3+ condition; With Reserve; Not sold at Hammer bid of $214,160 – RHD. Leather rim Moto-Lita steering wheel, Lucas lights, Avon tires, Hanhart stopwatches, braced rollbar, 4-point belts, hardtop, front fender vents, silver painted wire wheels. – Winning factory entry in the 1964 Spa-Sofia-Liege Rally driven by Rauno Aaltonen and Tony Ambrose. Restored for Peter Livanos at LME Healeys 2009-11. Sound paint with some orange peel on the driver’s door and minor stress cracks. Sound redone chrome. Good interior. Underbody has been done, then driven before being cleaned up for the auction. An historic and significant Austin-Healey. – Rallying was always close to Donald Healey’s heart and the effort the Austin-Healey factory team put into building their rally cars and recruiting the best drivers reflected Healey’s passion. This Spa-Sofia-Liege winner reflects that effort and it is surprising it didn’t attract more attention here at RM Sotheby’s Paris auction. 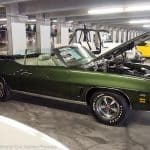 The seller’s decision not to take this meager offer should in no way reflect upon the quality of the car or its six-year old restoration. 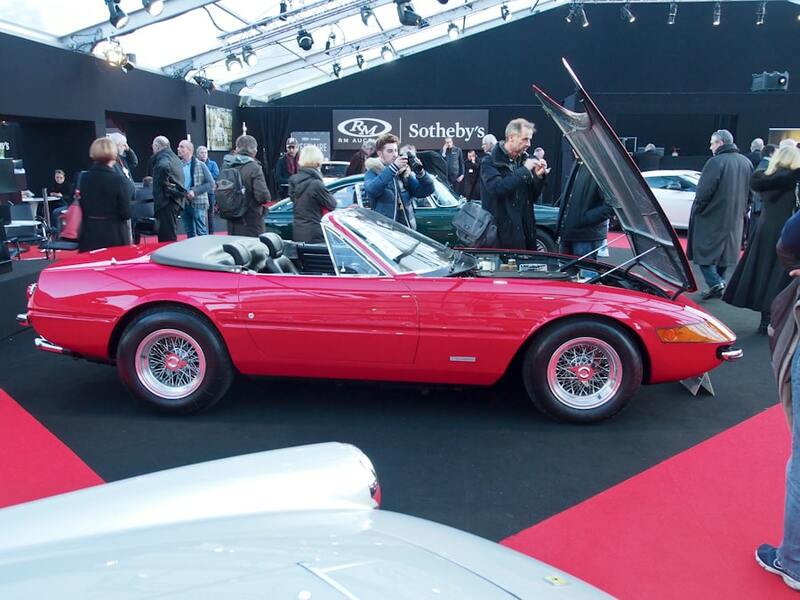 Lot # 145 1973 Ferrari 365 GTB/4 Daytona Spider, Body by Pininfarina; S/N 16801; Engine # B2630; Red/Black leather; Estimate $1,927,440 – $2,569,920; Older restoration, 2- condition; With Reserve; Hammered Sold at $2,061,290 plus commission of 12.00%; Final Price $2,308,645 – Becker Mexico cassette stereo, Veglia air conditioning, chrome spoke Borrani wire wheels, painted nose panel, popup lights, smog pump. – U.S. delivered new in the present colors. Restored like new in 1995 with excellent cosmetics and lovely interior with the original seat inserts, now aging gracefully and showing just 20,316 original miles. 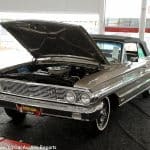 Original engine and denied Ferrari Classiche certification solely because its original U.S. side marker lights were removed in order to be operated legally in Europe. A sweet Daytona Spider that in reality needs absolutely nothing. – There are many cut Daytonas around but the rare appearance of a factory-cut car shows just how desirable these few (121 built) cars are. There is nothing realistically to fault about the presentation of this sparingly used 22-year old restoration, nor about the price it brought. Lot # 147 1970 Porsche 917/10 Prototype Spyder; S/N 917/10001; White, Light Blue nose/Red cloth; Estimate $4,925,680 – $5,889,400; Competition car, original as-raced, 3- condition; With Reserve; Not sold at Hammer bid of $4,176,120 – Covered headlights. – The first 917/10 Spyder. Tested at Weissach by Mark Donohue, Willi Kauhsen, Jo Siffert and Herrman Mimler. Later the test bed for the turbo flat 12 engine. Tested with several body designs on track and in the wind tunnel. Raced again and again for Porsche and Willi Kauhsen then stored from 1974-1997 when it was restored for Kauhsen. Restored again in 2014 in Gulf livery with the present engine. Described as the original tube frame. Duct taped body joints, oxidized engine and running gear. Comes with a spare, Bosch livered body. Has many needs in addition to a new owner. 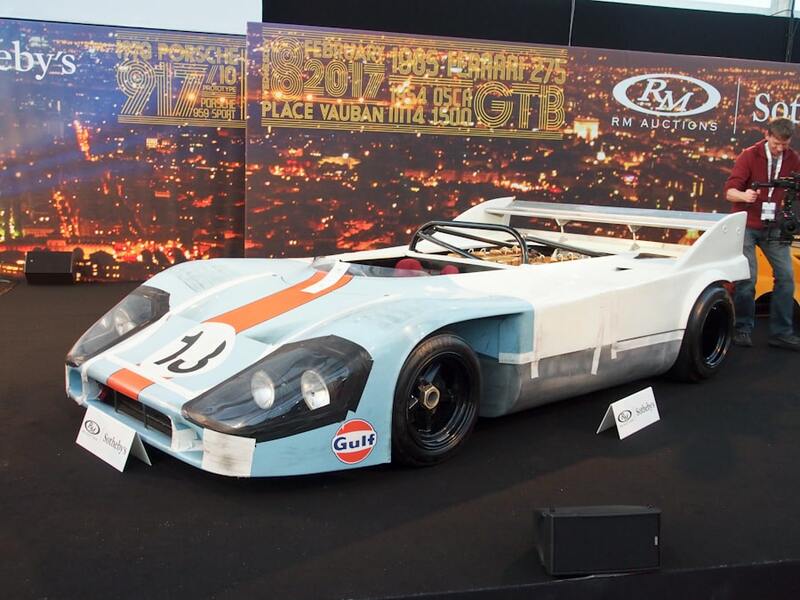 – The appearance of this 917, both to me and to other informed onlookers, belies the claim it was ‘restored’ in 2014. It is tired, oxidized and in no way reasonably exercised to its awesome performance potential without spending fantastic money on it. In its present condition it might do a few slow speed demonstration laps, but to what purpose? Under the circumstances the reported high bid is realistic. 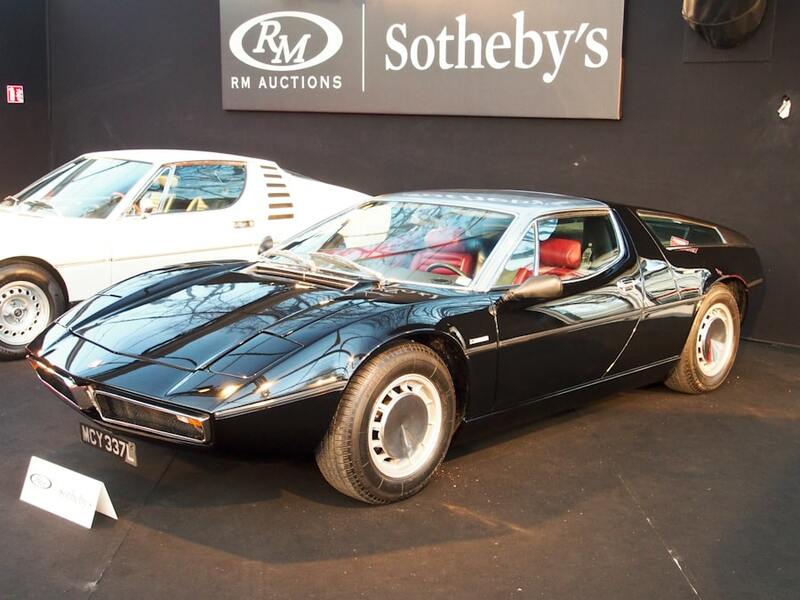 Lot # 148 1973 Maserati Bora 4.9 Coupe; S/N AM11749562; Engine # AM1071149562; Black/Red leather; Estimate $182,036 – $214,160; Visually maintained, largely original, 3- condition; With Reserve; Hammered Sold at $171,328 plus commission of 12.00%; Final Price $191,887 – Blaupunkt multiband radio, Pirelli P4000 tires, power windows. – Casually masked old repaint with a few scratches and chips. Worn original upholstery. Badly frayed original driver’s shoulder belt. Loose body side molding. Scuffed bright trim. Peeling old undercoat with surface rust underneath. A Maserati with many needs and few good surprises. – Sold by Gooding & Company in Scottsdale twelve months ago for $187,000. That price was Euros 172,600 where today the all-in price was Euros 179,200. That pretty effectively describes its value and the seller should be very happy to get out close to whole. Lot # 149 1969 Ferrari 365 GTB/4 Daytona Berlinetta, Body by Pininfarina; S/N 12801; Engine # B138; Red/Black leather; Estimate $749,560 – $803,100; Visually maintained, largely original, 3 condition; With Reserve; Hammered Sold at $674,604 plus commission of 12.00%; Final Price $755,556 – Gold painted three-lobe centerlock alloy wheels, Michelin XWX tires, Plexiglas nose panel, braced rollbar, 4-point belts, Blaupunkt AM-FM, power windows, rear brake scoops. – Several modifications were installed by Ch. Pozzi for the second owner, Joseph Zagori, including rear brake scoops, Group IV roll bar, competition differential, velocity stacks and cold air box and bigger wheels. 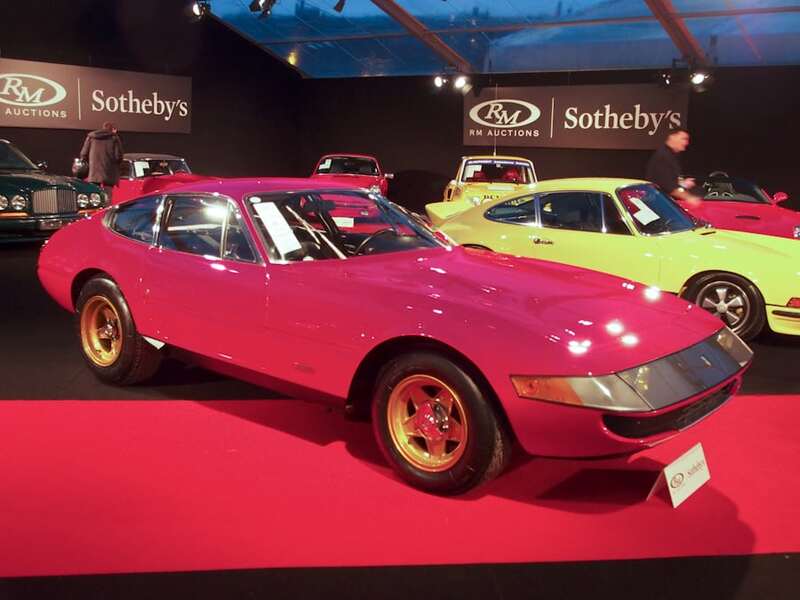 Later owned by Pierre Bardinon (the only Daytona in his collection) and Comte Frederic Chandon de Briailles. Good repaint, well worn but sound upholstery. Old undercoat in the wheel wells has been painted over. – Modified? No Ferrari Classiche cert for this Daytona, but who, in all good sense, really cares? 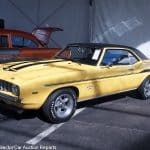 It was sold by RM here two years ago for $805,654, but that was Euros 705,600, exactly the same price it brought here in Euros even though it looks $50,000 less expensive in today’s stronger dollars. It’s a terrific Daytona with a choice provenance. Lot # 151 1962 Ferrari 250 GT Cabriolet Series II, Body by Pininfarina; S/N 3803GT; Engine # 3803GT; Bianco Pertito (Silver), Bianco Pertito (Silver) hardtop/Black leather; Black vinyl top; Estimate $1,049,384 – $1,284,960; Cosmetic restoration, 3- condition; With Reserve; Hammered Sold at $1,177,880 plus commission of 12.00%; Final Price $1,319,226 – Overdrive, chrome spoke Borrani wire wheels, Pirelli Cinturato tires, Becker Europa II stereo, two tops, driving lights behind the grille. – Decent repaint, good original creased upholstery, good major chrome, weak trim chrome, refinished wood steering wheel. Orderly but not restored engine compartment, chassis and underbody. Old soft top, crazed hardtop rear window, cracked rear lip on hardtop. A cosmetically restored driver. Ferrari Classiche certified. – Attractively but not comprehensively refinished, this is a Pf Cab driver that has many needs. None of them disqualify it from being driven and enjoyed but among its counterparts it’s not going to get many accolades. The price it brought would suggest it is a paragon among them and it is expensive in dollars, and really expensive in Euros. Lot # 157 1965 Ferrari 275 GTB Berlinetta, Body by Pininfarina; S/N 07341; Engine # 07341; Verde Pino/Beige leather; Estimate $1,927,440 – $2,355,760; Cosmetic restoration, 2- condition; With Reserve; Hammered Sold at $1,847,130 plus commission of 12.00%; Final Price $2,068,786 – Centerlock 3-lobe alloy wheels, Michelin XWX tires. – Bright, tree frog green fresh paint, bright chrome and nearly pristine upholstery. Good dash and bright gauges. Underbody was done a while ago and has some road dirt. Ferrari Classiche certified. – At Scottsdale last month it was difficult to sell a 275 GTB. Not so here, where this mediocre cosmetic restored short nose brought a superior price, particularly when the transaction is evaluated in Euros. A sound 275 GTB, but this is all the money for it. 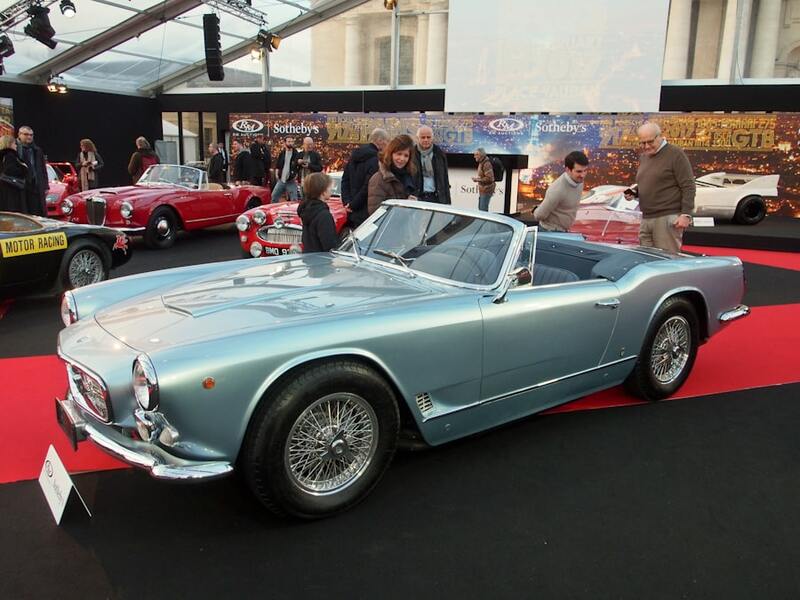 Lot # 160 1962 Maserati 3500 GT Spider, Body by Vignale; S/N AM1011365; Engine # AM1011365; Argento Luna/Blue leather; Black cloth top; Estimate $803,100 – $910,180; Cosmetic restoration, 3+ condition; With Reserve; Not sold at Hammer bid of $685,312 – ZF 5-speed, Webers, chrome spoke Borrani wire wheels, Michelin Pilote tires, Blaupunkt multiband radio, Personal steering wheel, Carello headlights and fog lights. – Very good new paint, interior and top. Orderly but not restored engine compartment and chassis. A presentable freshly cosmetically restored pretty car. – Sold by RM at Monterey in 2014 for $764,500 (Euros 570,900 at the time) fresh from restoration and sold then to an Italian owner. 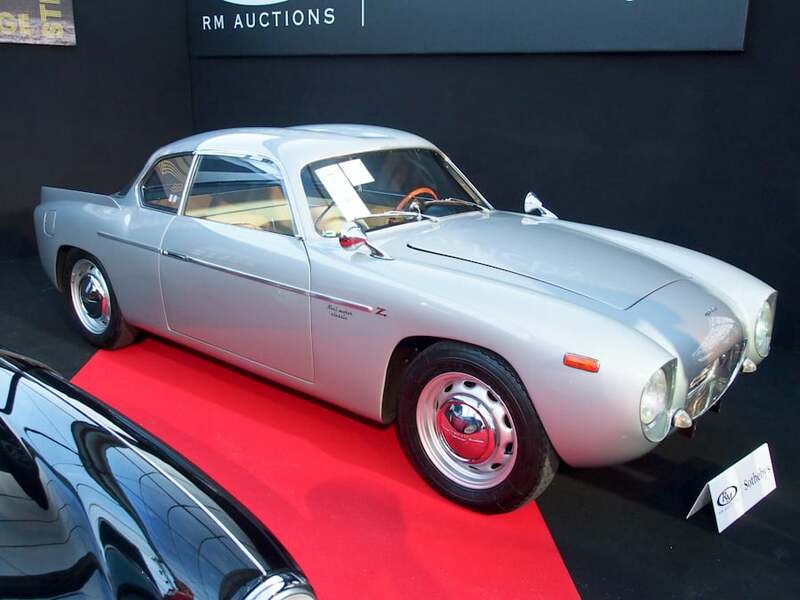 With that Euros price as a base it is difficult to understand why the Euros 640,000 high bid wasn’t cause to see the car well on its way to a new owner. It hasn’t gotten any better in three years. Lot # 161 1934 Alfa Romeo Tipo B P3 Monoposto; S/N 50006; Red/Brown leather; Estimate $4,069,040 – $5,354,000; Competition restoration, 3+ condition; With Reserve; Hammered Sold at $3,747,800 plus commission of 12.00%; Final Price $4,197,536 – 2,905/255hp, supercharged, live axles, quarter elliptical leaf springs, fire system, friction shocks with tube rear shocks, Dubonnet front suspension, SF #46. – Believed to have been returned to its original wide body in the early 50’s. Known history from new. New engine built in New Zealand, an original engine, SF-50-A from an Alfa Bimotore is included. Period race history is largely unknown, but reasonably surmised from its originality and completeness. Surface rusted rear quarter elliptic leaf springs, fresh paint, clean, orderly engine. A quality historic racecar. – Sold by RM at Amelia in 2000 for $2,145,000, this is a marvelous piece of Thirties racing history that stands up to close scrutiny for accuracy and impressive originality. It’s never been lost and resurrected and is a sound value at this price. Lot # 165 1989 Ferrari F40 Berlinetta; S/N ZFFGJ34B000080747; Engine # 16924; Red/Red cloth; Estimate $1,017,260 – $1,124,340; Unrestored original, 2 condition; With Reserve; Not sold at Hammer bid of $910,180 – Air conditioning, no cats, non-adjustable suspension, 4-point belts, manual windows. 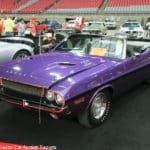 – Good paint and barely used interior. No nose chips. The underbody is clean and like new. Newly covered seats are barely used, with minimal wear from the belts. Ferrari Classiche certified. Belt serviced in 2014 with new tires. New fuel tanks and clutch more recently. 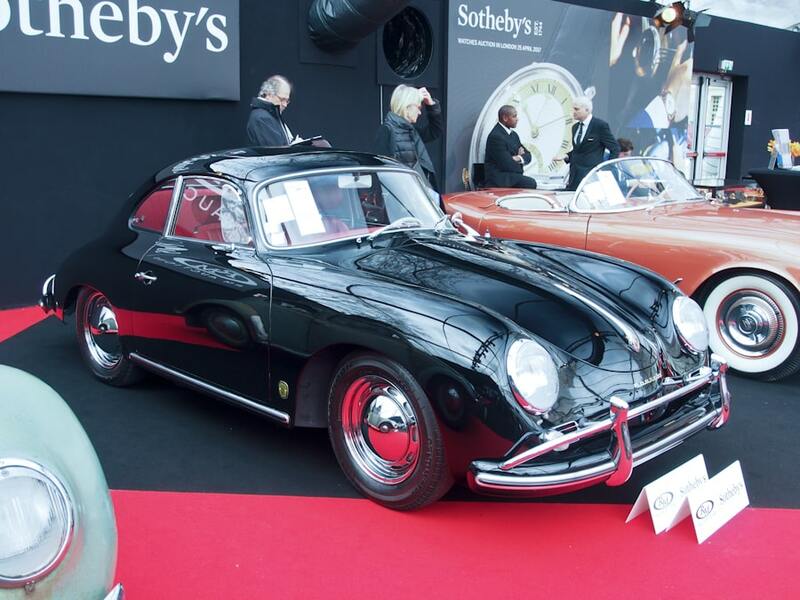 – Sold for Euros 949,000, $1,227,300 at the time, at RM’s London auction in 2014. A hundred thousand Euros is a big hit and the seller declined to take it. 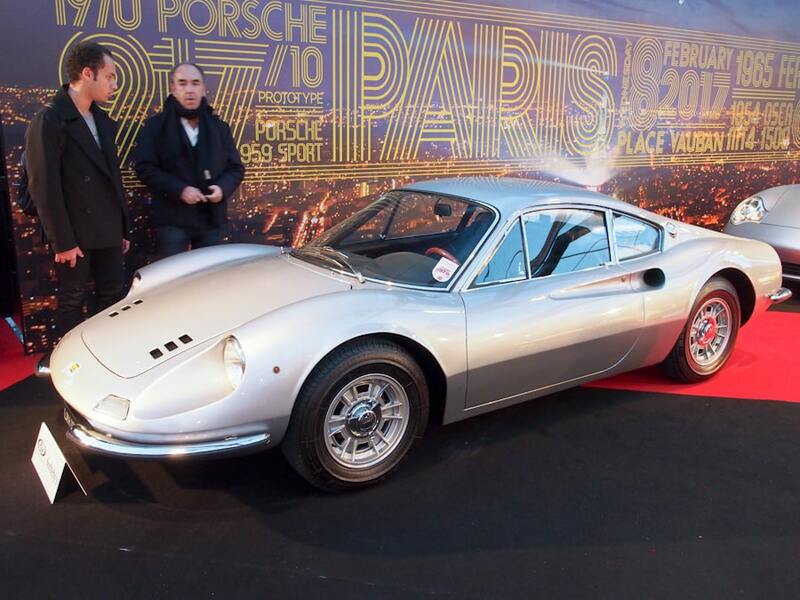 Lot # 166 1968 Ferrari Dino 206 GT Coupe, Body by Pininfarina; S/N 00238; Engine # 161; Silver/Black vinyl, Blue cloth inserts; Estimate $508,630 – $615,710; Recent restoration, 2 condition; With Reserve; Hammered Sold at $503,276 plus commission of 12.00%; Final Price $563,669 – Cromodora centerlock alloy wheels, Michelin MXW tires, woodrim steering wheel. – Replacement engine block. Excellent paint, chrome and interior. Underbody is restored like new and shows scant evidence of age or use. Ferrari Classiche certified with a Classiche-restamped block – This Dino 206 GT is hard to fault, aside from the replacement block, that is. And that makes its price reasonable. Ferrari Classiche has flexible standards: ‘We restamp the block and it’s like it’s ‘original’, right?’ It’s a lira-like lyric. 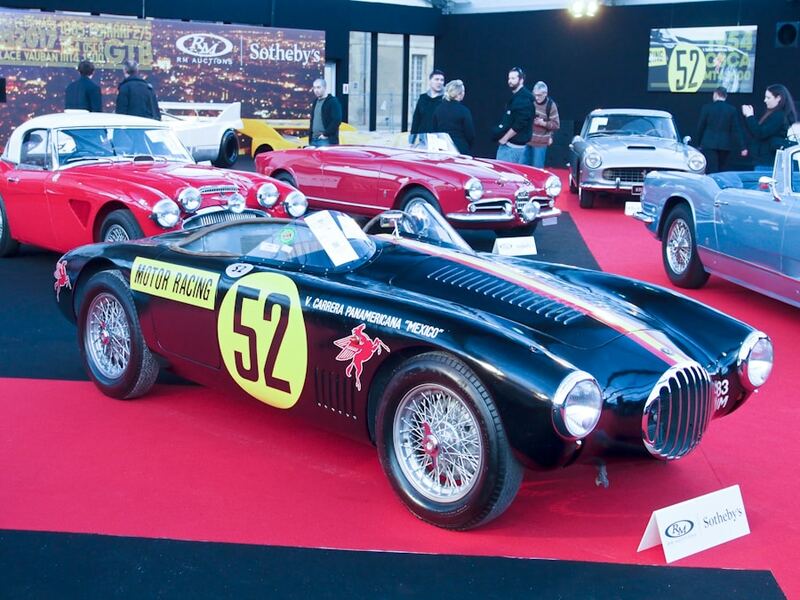 Lot # 168 1954 OSCA MT4 1500 Sports Racer, Body by Frua; S/N 1142; Black, Yellow, Red tape stripes/Brown vinyl; Estimate $1,044,030 – $1,258,190; Competition car, original as-raced, 3 condition; With Reserve; Not sold at Hammer bid of $835,224 – Dual ignition 1,491cc/135hp four, silver painted wire wheels, Dunlop tires, 4-spoke woodrim steering wheel, dual Plexiglas windscreens. – Raced when new by Giulio Cabianco, 2nd in class in the 1954 Mille Miglia, 10th overall. Later owned and raced by Alfonso de Portago in this livery, then in the 1954 at the Carrera Panamericana by Roberto Mieres where it dnf-ed. Later in the Rosso et Bianco collection. Restored in 2008 with a new cylinder head and now with a Hall & Hall replica engine. Presented in Carrera Panamericana livery with dull paint on dented, wavy body panels, sound old interior. A desired entrant in things people only dream about on the strength of its history – Dreams of Goodwood or hammering through Italy on the Mille Miglia only go so far and that wasn’t enough to propel this OSCA to a million dollar price, even though it might have been. 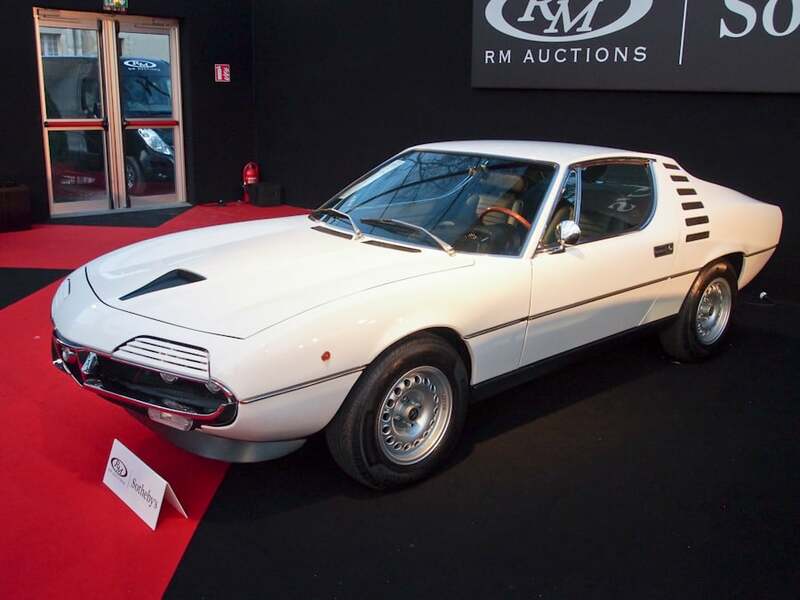 Lot # 171 1973 Alfa Romeo Montreal Coupe, Body by Bertone; S/N AR1426330; Engine # AR0056402373; White/Olive leather; Estimate $85,664 – $107,080; Visually maintained, largely original, 3+ condition; No Reserve; Hammered Sold at $74,956 plus commission of 12.00%; Final Price $83,951 – Alloy wheels, Pirelli P4 tires. – Painted assembled over old paint with some masking oversights. Scuffed trim chrome, scratched, sand pitted windshield, pitted rear hatch hinges. Original undercoat in the wheelwells. Good recent interior. A sound but unimpressive driver. – Gooding sold this car at Pebble Beach in 2013 for $99,000. RM did the same in 2015 for $110,000. It’s covered 365 km since it was seen in 2013 and isn’t getting any better for the passage of time or a few miles and this result is appropriate to its condition. 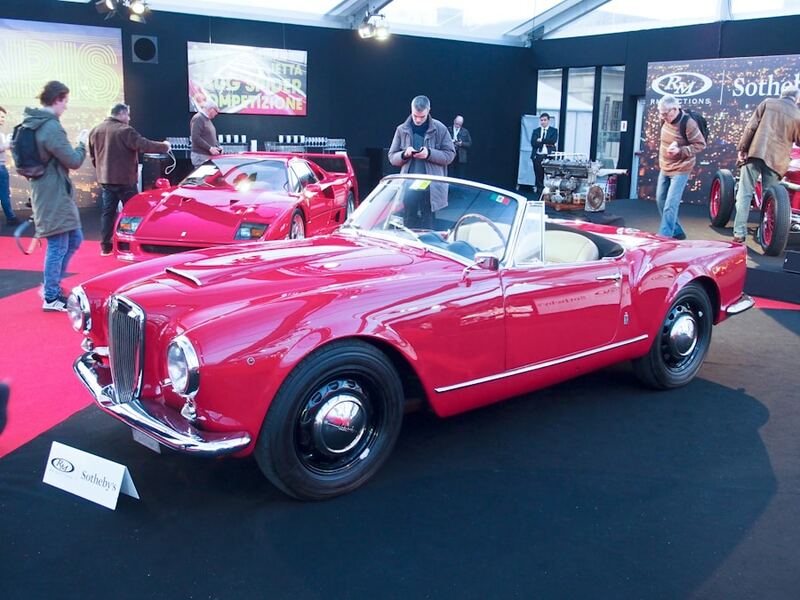 Lot # 172 1958 Lancia Aurelia B24S Convertible; S/N B24S1697; Engine # B24S1813; Red/Beige; Black cloth top; Estimate $321,240 – $374,780; Cosmetic restoration, 3+ condition; With Reserve; Not sold at Hammer bid of $289,116 – Woodrim steering wheel, Blaupunkt radio, black painted wheels, hubcaps, Michelin tires. – Very good fresh paint, chrome interior and top. Underbody is original and road grimy. Looks good under the lights. 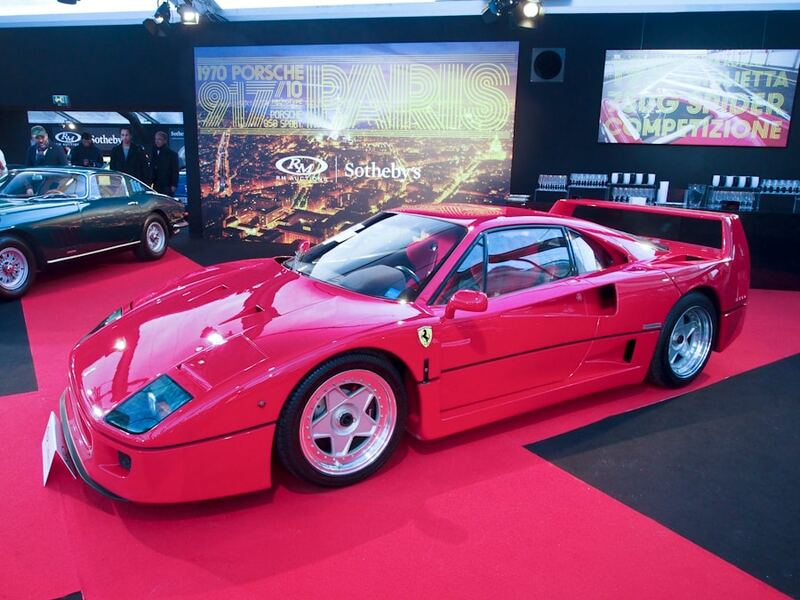 – Superficially presented and appropriately dismissed by the RM Sotheby’s bidders in Paris, if there was money in the tent anywhere close to the reported high bid it should have been gone and away to a new owner. Lot # 173 1958 Porsche 356 A 1600 Super Coupe, Body by Reutter; S/N 103435; Engine # 81936; Black/Red leather; Estimate $128,496 – $149,912; Older restoration, 3+ condition; With Reserve; Hammered Sold at $117,788 plus commission of 12.00%; Final Price $131,923 – Chrome wheels, hubcaps, Hankook tires, pushbutton radio, wind wings, bumper overriders, halogen headlights, sliding sunroof. – A Porsche press car when new. Represented as the original engine and gearbox. Sound older repaint with some orange peel, good chrome and interior. Orderly engine compartment and underbody. A driver quality Porsche with some miles. – The sunroof adds material value but only barely supports the price it brought in dollars. In Euros it is an even more sketchy value in its sound but well-used older restored condition. Lot # 175 1965 Alfa Romeo Giulia Sprint GTA Coupe; S/N AR613457; Engine # AR00502/A18868; Red/Black vinyl; Estimate $374,780 – $455,090; Visually maintained, largely original, 3 condition; With Reserve; Not sold at Hammer bid of $321,240 – Wide Campagnolo alloy wheels, Dunlop Racing tires, woodrim steering wheel, sliding panel Plexiglas side windows, 4-point belts, no bumpers, fiberglass doors. – Thick repaint over old paint, good interior and chrome. Wheels painted over old chips. Clean but aged engine compartment with Italian Webers. Old undercoat and overspray in the wheel wells. Panels fit well. Nose has been worked. Driver’s door drops. Tired but complete (including the correct spare.) 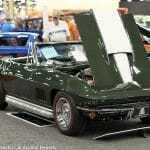 Represented to have its original GTA-spec engine and cylinder head. – Correctness counts, and this GTA has it in spades, but condition also counts, and this GTA is not very good, even for a race car. The reported high bid is appropriate for its originality and condition.